Mary P. Isenhour | Rooney Novak Isenhour Group, LLC. Mary has over 30 years of experience in government and campaigns working with elected officials and candidates at every level of government. In 2013, Mary was one of the first people hired by then-unknown-candidate Tom Wolf to serve as a senior advisor to his campaign. She went on to play a key role in his election as Pennsylvania governor in a win that few predicted. Mary then served as a senior member of his transition team that advised the new governor on his cabinet and filled key staff positions throughout his administration. At the same time, Wolf also tapped Mary to Co-Chair the Governor’s Inaugural Committee that was responsible for planning and executing his inauguration and inaugural celebrations. Mary became Governor Wolf’s first Secretary of Legislative Affairs, a cabinet level position. She was responsible for confirmation of the cabinet as well as all negotiations with the Republican-controlled legislature. Later in 2015 she became the governor’s Chief of Staff to oversee all administration agencies and over 80,000 employees. She served in that position until 2017, when she returned to the Governor’s re-election campaign. Before her work with Wolf, Mary served as Executive Director of the Pennsylvania Democratic Party, Pennsylvania State Director for Hillary Clinton’s 2008 Presidential Primary Campaign, and a senior advisor to Governor Ed Rendell and Pennsylvania House Democratic Leader Frank Dermody. From 2010 to 2014, she was a partner in a consulting firm, Isenhour Rooney Strategies. In 2006, Mary ran the state party’s successful coordinated campaign effort that saw wins for Governor Rendell, Senator Bob Casey, four new members of Congress and a Democratic majority in the Pennsylvania House of Representatives. Mary began her political career with the Kansas House of Representatives, serving as Communications Director and then Chief of Staff to the House Majority Leader. In 1995 became National Political Director at the Democratic Legislative Campaign Committee, and in 1999 Mary arrived in Harrisburg as the executive director of the Pennsylvania House Democratic Campaign Committee. Mary has participated and presented at many progressive and Democratic Party conferences and workshops. She also taught classes at Dickinson College and lectured at the University of Pennsylvania, Central Penn College and the Washington Center. 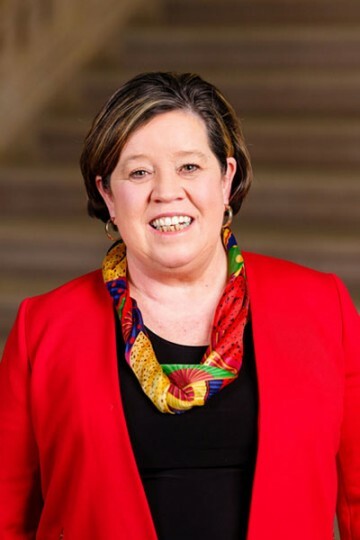 She served on the boards of Planned Parenthood and EqualityPA and is currently the Governor’s representative to the board of the Independence Visitors Center. In her spare time, Mary likes to cook on her pink stove, eat good meals and travel. She and her husband, Bill Patton, reside in suburban Harrisburg with Hank-the—cat and their Plott Hound, Shafer.